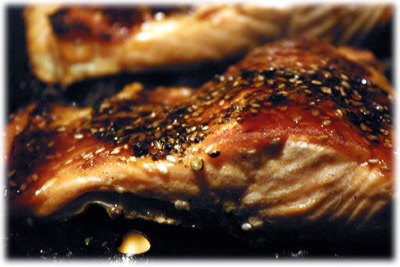 For this particular grilled trout recipe I like to use Steel-head Trout which is remarkably similar to Salmon in both look, texture and taste. It's doubtful many people would know the difference by look or by taste, even though the Steel-head is a variety of Rainbow Trout. 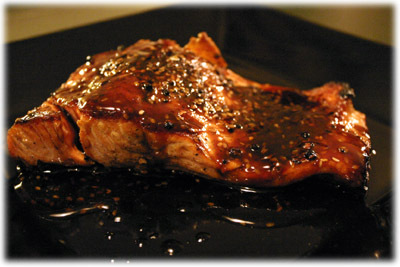 The picture below was taken just after this recipe was grilled with the Ginger Wasabi glaze applied. The trout is prepped for a very hot BBQ with a crushed peppercorn, kosher salt and sesame seed crust to help seal in the flavor. 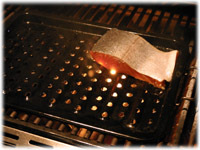 I've been using a well-oiled perforated grill topper (picture just below) lately for fish with great results, but cooking grilled trout directly on the grates is usually pretty easy too. Trout is a very forgiving fish in terms of cooking and won't fall apart easily on the grill, but if you're not fond of this fish then give salmon a try instead with this recipe. 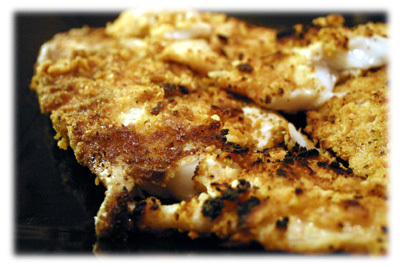 If buying 1 large piece of trout cut it into 4 smaller portions of equal size. 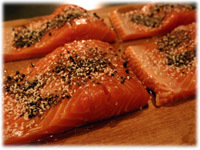 Rub equal amounts of the crushed peppercorns, kosher salt and sesame seeds over the flesh side of the trout (not the skin side). 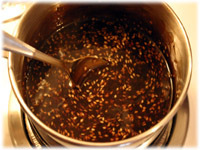 In a small saucepan add the soy sauce, wasabi paste, liquid honey, sherry (or port), sesame seeds and grated ginger. Combine the cornstarch to the hot water and stir to make a slurry or paste. Add this to the saucepan when it begins to boil and stir regularly, then reduce the heat to a very gentle simmer for about a minute until it thickens. Reduce the heat and just keep the glaze warm. 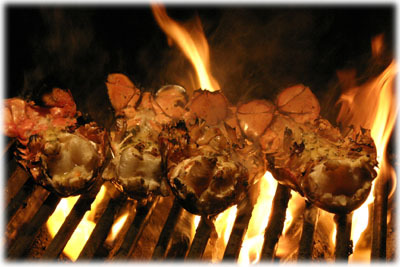 Preheat the grill to 700F (if possible, or the highest temperature you can get). Spray a grill topper very well with cooking oil spray or use a paper towel soaked in oil to rub over the perforated topper. 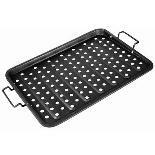 Place the topper on the grates to heat up with the BBQ. 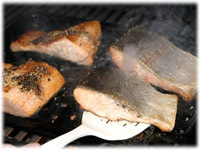 When the BBQ is at cooking temperature place the trout, flesh side down (skin side up) on the grill topper or grates. After a couple minutes at high heat the grilled trout should be ready to flip. 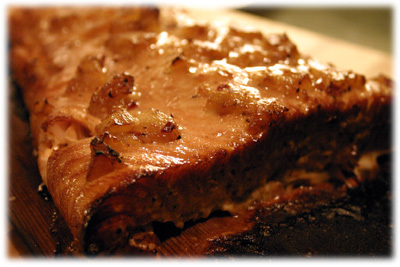 You should notice the flesh becoming slightly opaque and the flesh side against the grill should be browning up. Spoon some of the ginger wasabi glaze recipe on top of the grilled trout flesh side up, reserving a small amount to apply when the fish is removed. Close the lid and let the trout cook another 3 minutes. 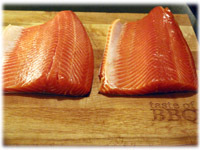 As you remove the fish from the grill to a serving platter you should be able to slip a spatula gently between the skin and the flesh to separate the two. 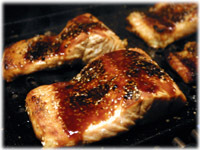 Place the grilled trout on the serving platter and drizzle with any remaining glaze.